Villa of Californian type of a living area of ​​160 sqm on enclosed land with trees of 600 sqm with 200 sqm of terraces in the ground floor and upstairs. It is composed in its rdc of an entrance, living room-stay 50 m ², independent modern kitchen, 1 room with bed 160 cms with its parental suite SE shower with the Italian, ind. Wc, storeroom; on the 1st 4 bedrooms, 2 with 2 beds 140 cms, 1 bedroom with 1 bed 160x190, 1 bedroom with 2 bunk beds 90x190, bathroom spa bath, wc ind. Each upstairs bedroom opens onto a south-facing terrace. 2 private parking spaces. 1 Place non private parking in the residence. bathroom walk-in shower on the ground floor. bathroom with spa bath on the 1st floor. outdoor pool side shower. Ideally located 10 mins from town center on foot, in a private residential area fenced and wooded. Household optional 80 euros. The villa was beautiful, comfortable with some luxuries. The pool was ideal and cooling in the soaring heat. All the facilities both inside and out were great, with adequate space for a family of five adults to have time together and individual space. With easy parking and all the necessary modern essentials, including washing machine, dryer and dishwasher, we really felt like it was home from home in the sun. Angelique was helpful without intruding and made us very welcome. We had hoped that the villa was a little nearer to restaurants so that we could walk to dinner but as we had rented a car this was barely an inconvenience. Avignon itself had lots of great places to eat (our favourite turned out to be Le Conservatoire near Les Halles, with great food and service - try the magret de canard). We toured some of the area by car, enjoying Arles in particular. We would recommend the villa happily and would be glad to return in the future. Super maison tranquille, bien climatisée, facile d'accès pour Avignon. Propriétaires bien accueillants et serviables. Maison impeccable, bien équipée, décorée. Avec un peu plus d'ombre dans le jardin, cette maison mériterait 5 étoiles. Belles escapades au Mont Ventoux et dans les vignobles notamment Vacqueyras. 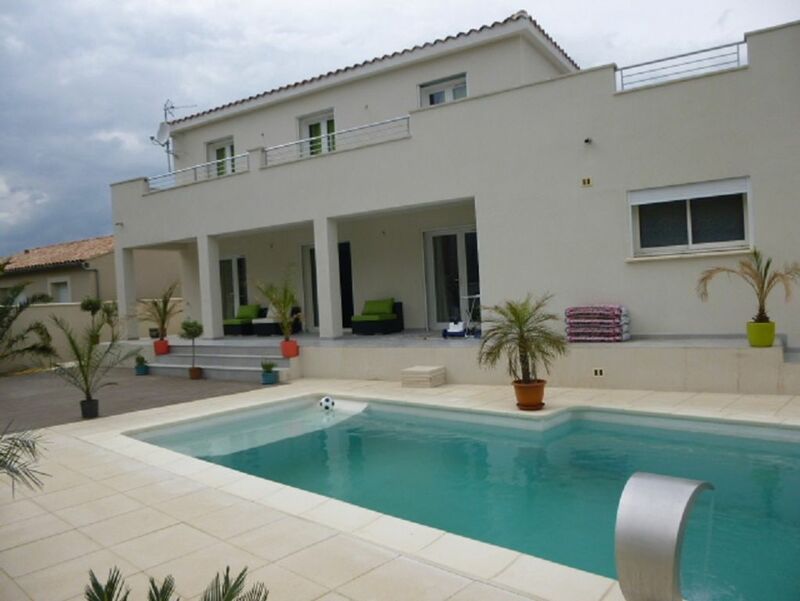 La location de cette villa est idéale. Tout correspond exactement au descriptif en y ajoutant la gentillesse de la propriétaire. Nous étions 6 adultes et un enfant, la piscine a été très appréciée. Nous recommandons sérieusement cette location. La villa se situe dans un quartier calme, tout en étant assez proche du centre ville. Nous y avons passé un excellent séjour entre amis!!! Merci à nos sympathiques locataires. Nous sommes vraiment ravis que vous ayez passé un agréable séjour! The Tour Philippe le Bel in Villeneuve-les-Avignon. The Avignon Festival in July. Place de l'Horloge with its beautiful riding school and town hall. Nearby villages such as Isle sur la Sorgue, St. Remy de Provence, Baumes de Venise Provence who breathe with their olive trees, lavender, oleander and cellar tours. Fontaine de Vaucluse, the Beams of Provence, the Pont du Gard and its luminescence.